If you need an easy chicken recipe with just a few ingredients this is a great one. 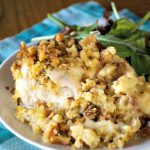 This Crock-Pot Swiss Chicken Casserole is creamy, cheesy, with a little crunchy top that you will love! I threw this casserole together on a whim simply because I had some chicken already thawed and needed to come up with something to do with it for dinner. I wanted something easy but of course it had to be tasty too! Luckily I had some stuffing mix and a can of cream of chicken soup already in my pantry. And some Swiss cheese in the refrigerator. My family really enjoyed this recipe as I am sure yours will too! A nice side salad or perhaps some steamed vegetables served as a side dish makes this a complete dinner. Oh and if you need to bring a casserole dinner to a sick friend, I think this would be great for that! With just a handful of ingredient you can have this delicious slow cooker casserole cooking away for dinner. 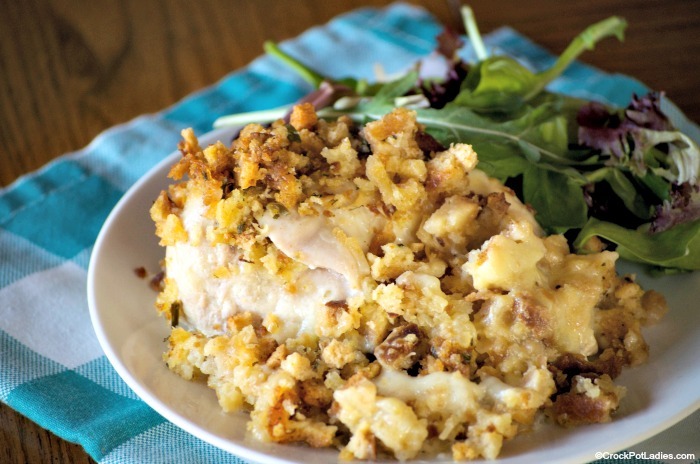 Pair the casserole with a nice side salad or some steamed vegetables for a complete dinner! If desired, spray a 6 quart or larger slow cooker with non-stick cooking spray to make clean up easier. Place chicken breasts in bottom of slow cooker in a single layer. Lay slices of Swiss cheese on top of chicken breasts. In a small mixing bowl, combine together the can of soup, milk and melted butter. Pour soup mixture mixture over chicken breasts. 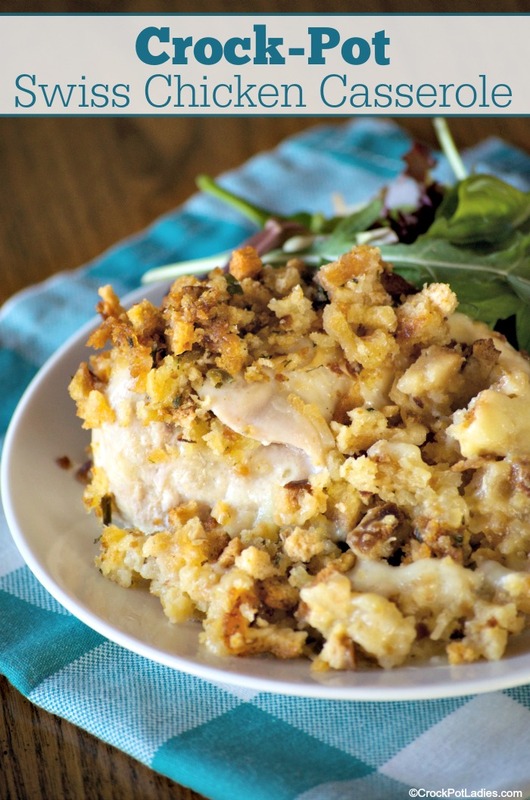 Top everything with the dry stuffing mix. Cover and cook on LOW for 8 to 10 hours or on HIGH for 4 to 6 hours. Feel free to use other cream of soups instead of cream of chicken soup if you prefer. Cream of mushroom or cream of celery soups would all be quite tasty. Gotta try this! Sounds yummy!! What kind of stuffing did you use? Did you use raw chicken or cooked? Hi Kelsey, the chicken in this recipe is raw when you place it in the crock-pot. This is one of the best crock pot recipes I have ever made. I have made it several times now and it always turns out great. Thank you for sharing it! Glad you like it! It is always nice to hear that recipes are enjoyed by our readers. thank you. I forgot to get stuffing! I have some brown rice. Would that be ok? I LOVE THIS WEBSITE! Thanks! The only real problem with rice is it tends to get mushy. I would wait till nearly the end and put it on, so it doesn’t have a chance to swell up too much. Hi ! 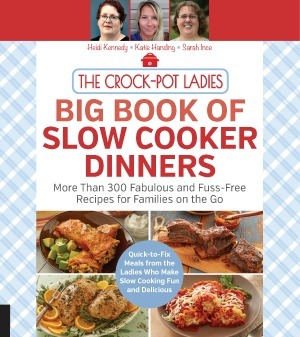 How do you know what size crockpot to use ? My old one just died and I need to buy a new one but I am so unsure as to if I should buy a 5 qt or 6 qt one. Just depends on family size or what types of food and uses you want to use it for. you can cook any size recipe in a larger one (dip to full chicken). I made this & followed the directions exactly. I put it on high & was gone but was able to be back in 4 hours. When I looked @ it the stuffing had turned black & it was burnt. My hubby tried to stir it up & that made it worse. Now all the burnt part is intermingled with the rest of it. I was going to try to just scrape the burnt part off & salvage the rest. I did taste the chicken & it was OK, but very dry. What in the world did I do wrong? The kids were going to come over & eat, but not now. It sounds like maybe your crock-pot cooks on the higher temperature side of things. Sorry it didn’t come out right for you Trudy. JUST GOT THIS OLDER RECIPE. Do you have to use reduced fat cheese & soup? No. Reduced fat cheese and soup is nice for those on weight watchers or just want lower calories. I’ve made this dish with regular soup and cheese. Turned out good. Yes, you can use regular soup and cheese and the recipe comes out great. The reduced fat varieties are listed for those who want to make this is a tad bit healthier. You do not need to use reduced fat cheese or soup Marlene, the dish comes out fantastic using the regular varieties of both. My Swiss cheese got grainy and there was no “sauce” what so ever. I used evaporated milk. Would that matter? I am not sure Susan the evaporated milk may have been an issue.